Residential areas are one of the places with the most traffic and nearest to many consumers. And with changes in consumption habits, new business ideas have emerged. One example is XiangShou XiaoHe享收小盒 (XiangShou), which uses a foldable drop box to place letters, parcels and even groceries right outside the house. Through Xiang Shou’s WeChat mini program, users are able to receive parcels, groceries, and even breakfast meals when they are not home. It is like an upgraded version of the neighbourhood lockers. XiangShou brings more convenience to consumers by placing a personal locker at their door and saving them the hassle to travel to the nearest lockers. Alibaba’s CaiNiao 菜鸟, a logistic platform to accelerate e-commerce delivery also launched a similar product called “CaiNiaoXiaoHe菜鸟小盒” to make ‘new retail’ even more convenient by purchasing items without leaving the house. KrASIA’s parent company, 36Kr, learned that XiangShou has expanded to 541 areas in China. 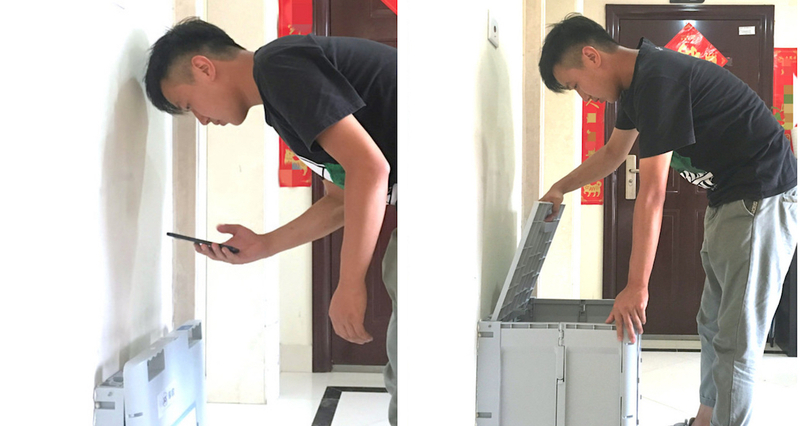 Founder Su Haihui believes that the consumers prefer to receive parcel personally rather than have them placed in public lockers. XiangShou began their operations in June this year, covering two large residential areas with 1,665 boxes. Their operation is simple — in each community, there is a station and individual drop boxes. XiangShou cooperates with logistics companies to get them to distribute the large items to the station and small items to the drop boxes. Currently, the box size is 40 x 40 x 50cm (length, width, height) and 40 x 10 x 50 when folded. The box is developed by the team at cost price of 100 yuan. Cooperate with real estate. Parcels can only be delivered when there are people in the house or shoe racks at the door. Thus, consumers are very receptive to the idea of a drop box. However, there might be space constraints. XiangShou will be partnering with developers and real estate companies by paying a fee for the use of space and promotion. Work with logistics companies. There are different types of residential areas and parcels are handled differently. In future, XiangShou will be developing boxes of different sizes to suit different needs. In addition to production costs and real estate partnership fees, the biggest cost is concentrated on operations and maintenance. The present plan is that deliverymen will collect the parcels from XiangShou station that serves a few nearby communities. Customers do not have to pay for the drop box, but XiangShou has two revenue streams. Firstly, a cut is obtained from the courier fee (the consumer does not need to pay extra). Su Haihui told 36Kr that based on the current model, this income can at least guarantee breakeven if current users engage in their app every 2.5 days. There is a sizeable group of families receiving 2 to 3 parcels a day. Secondly, traffic monetisation. To use XiangShou’s service, users will have to open a mini program on WeChat. At present, XiangShou is delivering two categories of products – grocery and breakfast. Users can place an order with the goods directly delivered in the box for about an additional 14 yuan. Conversion rate is currently at 30%. XiangShou believes that delivery is not only limited to e-commerce products, grocery, and breakfast. They plan to expand their services to deliver other items such as second-hand products, laundry, retail products, lunch and dinner and so on. Alibaba’s CaiNiao has launched its own dropbox and many logistics companies may follow suit. With regards to potential competitors, Su Haihui said that users will not accept two boxes at the door, so being the first-mover and being able to expand quickly is crucial. Also, it is not profitable to rely solely on selling the drop box. The new entrant must cover the whole delivery process to make this business profitable, so the barrier to entry is significantly high. Su Haihui also told 36Kr that the entire logistics market is very large and profitable enough for more than two companies. Su Haihui was once a co-founder of furniture app Jian Dian Dian家点点, and responsible for HR and sales. The XiangShou management team is also experienced in online to offline operations. Previously, XiangShou has received tens of millions of funding from Hongli Venture Capital and Qingsong Fund. This article is powered by AI, and was first seen on KRAsia.